Hernias of the abdominal wall occur through defects in fibromuscular tissue, which can be congenital or acquired. These areas of weakness lead to defects, which allow intra-abdominal structures to herniate beyond the normal boundaries of the abdominal wall.1 This paper will review common hernias of the abdominal wall, as well as hernias that require more urgent intervention. The most common presenting symptom from a groin hernia is a chronic heaviness or a sense of discomfort that is most pronounced during physical activities, such as lifting and running.8 Many patients also notice a focal protrusion, especially when they are standing up or with an increase in intra-abdominal pressure. Advantages of sonography include availability, portability, low cost, and lack of exposure to ionizing radiation. The capability of real-time imaging is of paramount importance as patients can direct the attention of the radiologist and sonographer to the region of concern and perform maneuvers to increase visibility of the hernia. Sonographic evaluation usually starts with a low-frequency curved probe (3.5 MHz-5MHz), which is particularly important in overweight patients since the hernia may be beyond the depth of penetration of the high frequency transducers. A secondary focused exam is performed with a high-frequency linear probe (7.5 MHz-10 MHz). Supine imaging using Valsalva maneuvers as well as upright scanning often help to identify intermittent or sliding types of hernias (Figure 9). 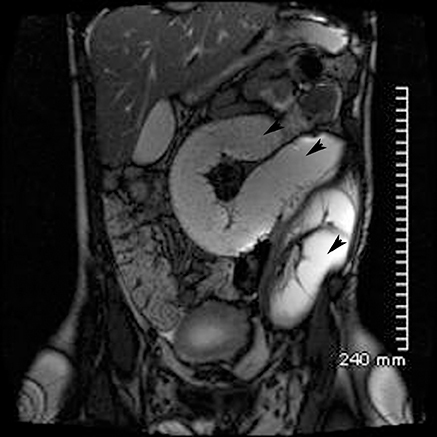 If small bowel loops are present in the hernia sac, these can usually be identified with sonography as they have the typical multi-layered gut signature (Figure 10).Cine clips can be obtained for comparison to the unaffected side. 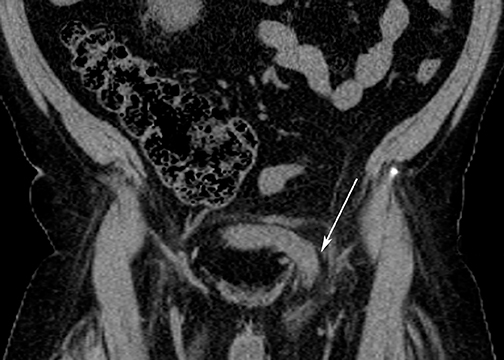 Magnetic resonance imaging (MRI) can detect and characterize hernias, as well as differentiate inguinal from femoral hernias with a high sensitivity and specificity (Figure 11).21 Potentially useful sequences include coronal 3-dimensional T1W VIBE (Volume Interpolated Breath Hold, Siemens) without fat saturation during Valsalva and at rest, as well as axial TSE T2 and Axial STIR (short Tau inversion recovery), including both groins for comparison. Advantages include lack of ionizing radiation and characterization of hernias without IV contrast. Disadvantages include cost, increased imaging time, and the inability to image in real-time. 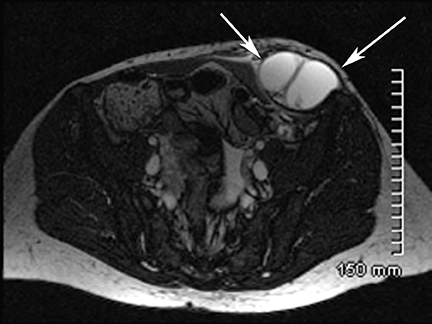 Therefore, in many centers, assessment of hernias with MRI remains limited to special cases. Inguinal hernias are the most common type of hernias in the North American population. Paraumbilical and inguinal hernias may develop as a result of a sudden strain or with athletic activities but often arise without any identifiable causative event. Femoral hernias and obturator hernias are more commonly associated with complications such as bowel obstruction and strangulation,due to their anatomic location. 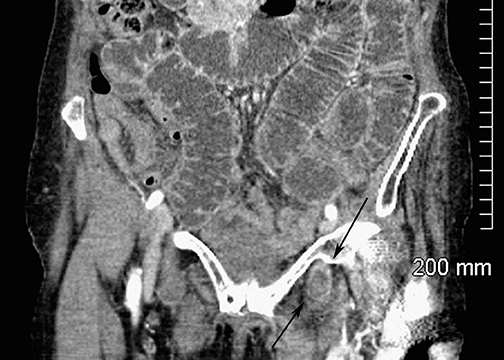 Richter’s hernias are uncommon, but the focal herniation of the anti-mesenteric side of the bowel predisposes patients to ischemic bowel changes without associated obstruction. Sonography is the preferred modality used for assessment of inguinal hernias due to lack of ionizing radiation and directed scanning over the area of pain. Use of positional or Valsalva maneuvers with a high-frequency probe yields > 90% accuracy in identifying hernias in the groin region. 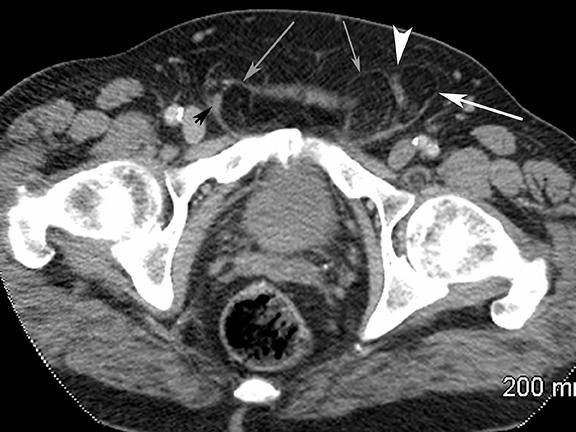 In locations other than the groin or in cases with concerning clinical features, such as obstruction or ischemia, CT is preferred as the initial imaging modality. Pans A. New prospects in the etiology of groin hernias. Chiurgie. 1999;124:288-297. Richards AT, Quinn TH, Fitzgibbons RJ Jr. Abdominal wall hernias. In: Greenfield LJ, ed. Surgery. 3rd ed. Philadelphia, PA: Lippincott Williams & Wilkins, 2001:1185-1223. Cassar K, Munro A. Surgical treatment of incisional hernia. Br J Surg. 2002;89:534-545. Gurer A, Ozdogan M, Ozlem N, et al. Uncommon content in groin hernia sac. Hernia. 2006;10:152-155. Hutchinson B. Amyand’s hernia. J R Soc Med. 1993;86:104-105. Aguirre DA, Santosa AC, Casola G, Sirlin CB. 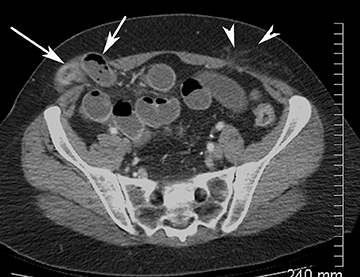 Abdominal wall hernias: Imaging features, complications, and diagnostic pitfalls at multi–detector row CT. Radiographics. 2005;25:1501-1520. Skandalakis PN, Zoras O, Skandalakis JE, Mirilas P. Richter hernia: Surgical anatomy and technique of repair. Am Surg. 2006;72:180-184. Brooks DC, Turnage R, Pories SE. 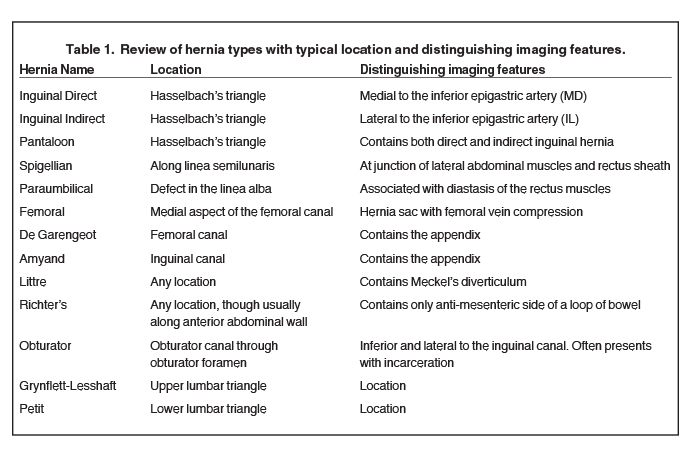 Classification and diagnosis of inguinal and femoral hernias. Updated 2010 literature review version. 2010;18.2. Kulstad E, Pittman L, Konicki P.J. Ultrasound in the diagnosis of incarcerated hernia. The Internet Journal of Emergency Medicine. 2003;1. DOI: 10.5580/2229. Balthazar EJ, Birnbaum BA, Megibow AJ, et al. 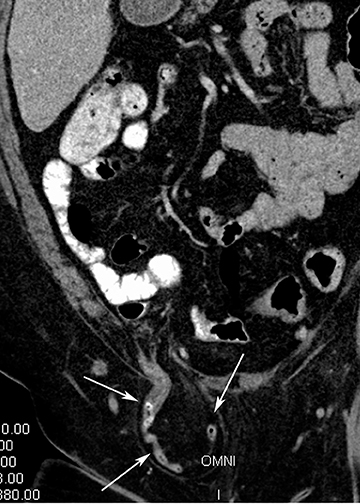 Closed-loop and strangulating intestinal obstruction: CT signs. Radiology. 1992;185:769-775. Bhosale PR, Patnana M, Viswanathan C, Szklaruk J. 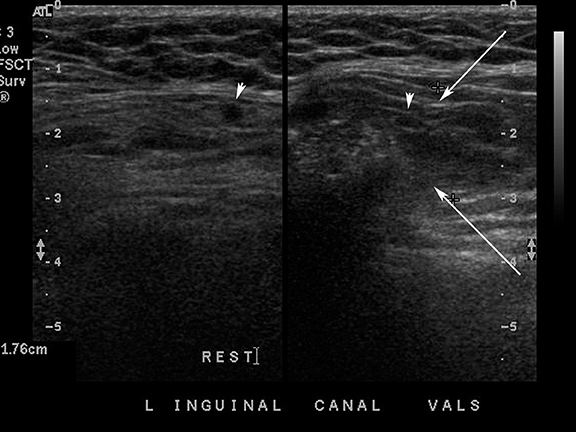 The inguinal canal: Anatomy and imaging features of common and uncommon masses. Radiographics. 2008;28:819-835. Burkhardt JH, Arshanskiy Y, Munson JL, Scholz FJ. 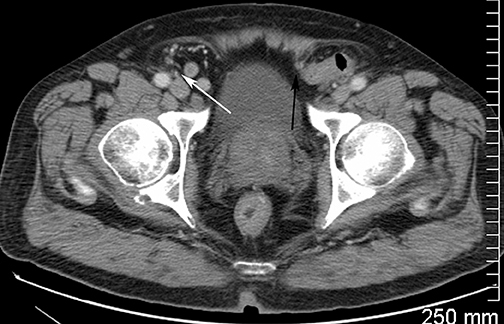 Diagnosis of inguinal region hernias with axial CT: The lateral crescent sign and other key findings. Radiographics. 2011;31:E1-E12. Steadman’s Medical Dictionary. 28th ed. Baltimore, MD: Lippincott Williams & Wilkins; 2005. Read RC. Metabolic factors contributing to herniation: A review. Hernia.1998;2:51-55. Sorensen LT, Friis E, Jorgensen, et al. Smoking is a risk factor for recurrence of groin hernia. World J Surg. 2002;26:397-400. Carbonell JF, Sanchez JL, Peris RT. 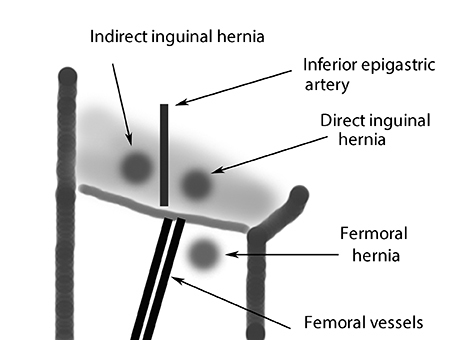 Risk factors associated with inguinal hernias: A case control study. Eur J Surg. 1993;159:481-486. Kang SK, Burnett CA, Freund E, Sestito J. Hernia: Is it a work-related condition? Am J Ind Med. 1999;36:638-644. 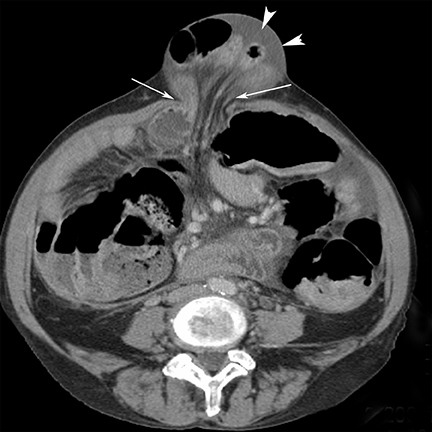 Smith GD, Crosby DL, Lewis PA. Inguinal hernia and a single strenuous event. Ann R Coll Surg Engl. 1996;78:367-368. McIntosh A, Hutchinson A, Roberts A, Withers H. Evidence-based management of groin hernia in primary care--a systematic review. Fam Pract. 2000;17:442-447. Suzuki S, Furui S, Okinaga K, et al. 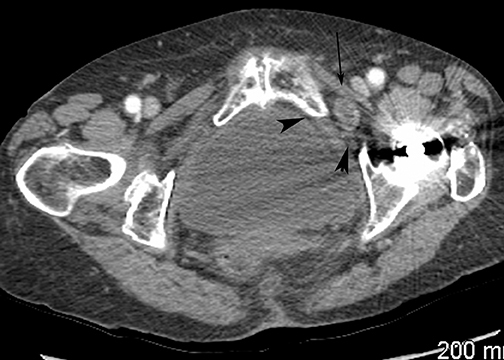 Differentiation of femoral versus inguinal hernia: CT findings. AJR Am J Roentgenol. 2007;189:345. Van den Berg JC, de Valois JC, Go PM, Rosenbusch G. Detection of groin hernia with physical examination, ultrasound, and MRI compared with laparoscopic findings. Invest Radiol. 1999;34:739-743. 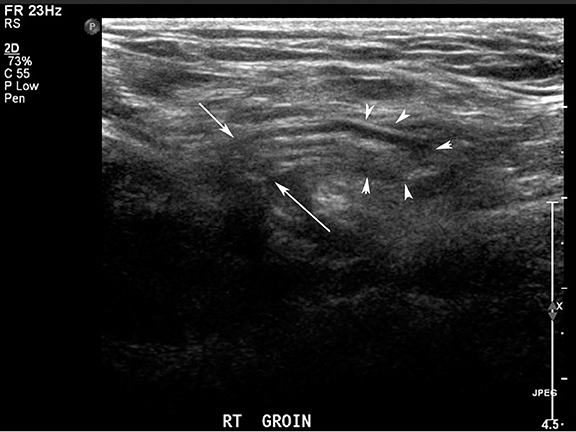 Korenkov M, Paul A, Troidl H. Color duplex sonography: diagnostic tool in the differentiation of inguinal hernias. J Ultrasound Med. 1999;18:565-568. Lilly MD, Arregui ME. Ultrasound of the inguinal floor for evaluation of hernias. Surg Endosc. 2002;16:659-662. Parra JA, Revuelta S, Gallego T, et al. Prosthetic mesh used for inguinal and ventral hernia repair: Normal appearance and complications in ultrasound and CT. Br J Radiol. 2004;77:261-265. Haraguchi M, Matsuo S, Kanetaka K, et al. Obturator hernia in an ageing society. Ann Acad Med Singapore. 2007;36:413-415. Martin M, Paquette B, Badet N, et al. 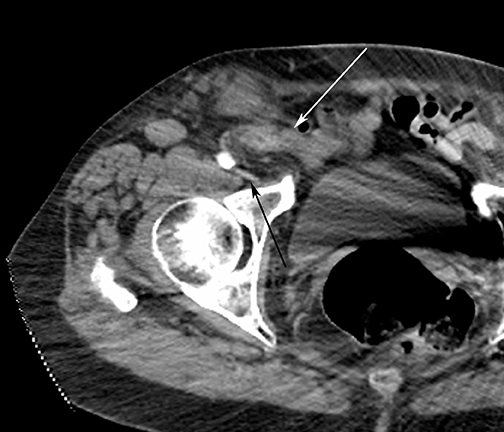 Spigelian hernia: CT findings and clinical relevance. Abdom Imaging. 2012. [Epub ahead of print]. Netto F, Spencer AC, Hamilton P, et al. Traumatic abdominal wall hernia: Epidemiology and clinical implications. J Trauma. 2006;61:1058-1061. Muscle beach: Abdominal wall musculature and associated hernias. Appl Radiol. Dr. Kielar, Dr. Duigenan, and Dr. McInnes are in the Department of Radiology at the University of Ottawa, The Ottawa Hospital, Ottawa, Ontario,Canada.